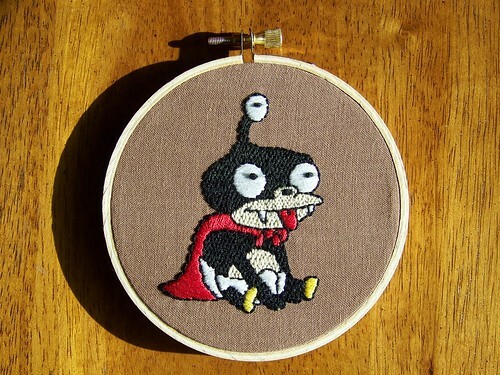 Behold, Lord Nibbler the Nibblonian from Futurama! He may not look very regal in this pose, but make no mistake, he'll vaporize you with his kitten-class attack ship (unless you can fight him off with a folding chair). His likes include devouring hams (and live animals) whole, being scratched behind the ears, and messing with the space/time continuum. His dislikes include intergalactic pet pageants, flying brains, and high-velocity mail. 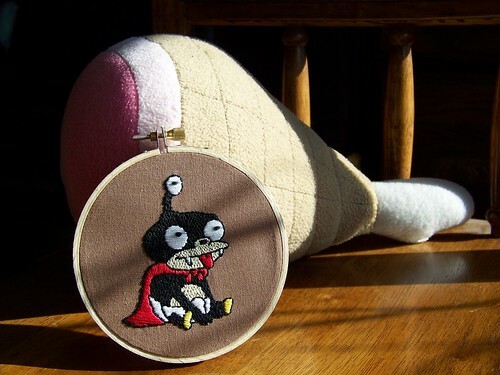 He's stitched up with back stitch, satin stitch, long-and-short stitch, and french knots. He stands (well, sits) around three inches tall, and is mounted in a four inch frame. I know where you live and I'm coming to get this Super fantastic job. This so rocks, several times over. OMG!!!! This is freakin' FANTASTIC!!!! Even if I wasn't I huge Futurama nerd (but I am) I would still say that this is freaking awesome!! I want one! Great job, your stitching is beautiful. That rocks! Awesome stitching, thanks for sharing!! !